With summer underway, Atari has announced the latest update to their free-to-play mobile title Roller Coaster Tycoon Touch. The latest update release is sure to give fans plenty of summertime fun. Roller Coaster Tycoon Touch is the first RCT game designed for play on mobile devices. Building, and managing your best coaster and theme part creations is just part of the fun. With the built in social features, players can share their best creations with others. Players can also open card packs full of coasters, rides, decorations, and more to help expand their roller coaster theme park. With the brand new RollerCoaster Tycoon Touch Summer update, you can now build your summer-themed dream park, complete with new rides, shops, decorations and the Shark Entertainer! Whether you’re relaxing at the beach or cooling off indoors to escape the heat, the RollerCoaster Tycoon Touch Summer update is the perfect past time. Find and collect 30 exclusive Summer cards, including a ride, shop, restaurant, 14 coaster parts, 3 colors and the Shark Entertainer! Collect every Summer decoration before the end of August to unlock the Summer fence. 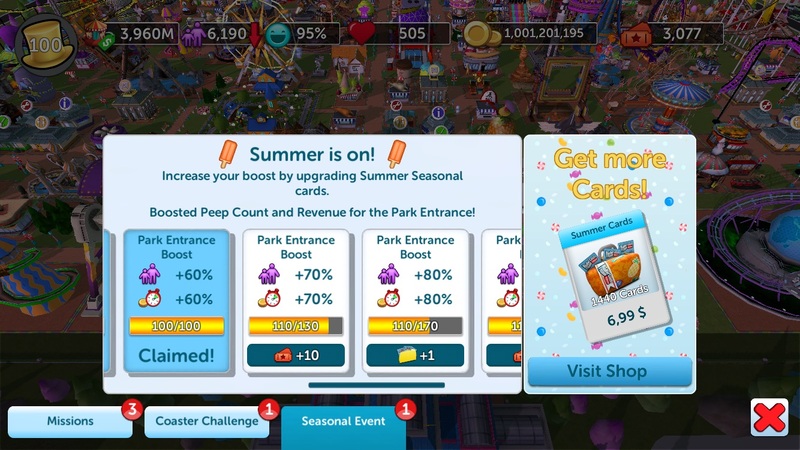 Level up your seasonal cards to trigger additional revenue and Peep boosts! Play the new “Like Sardines” Scenario and collect 3 new ride skins! Scenario medals are converted into additional park value for your main park and Scenario rewards can now be claimed as soon as you reach the objectives. Tired of tapping thought bubbles? Watch a new video ad to get free hearts, or visit the store to buy the Heart Pack. With limits removed on hearts, you can now collect and store as many as you want! Ready to try out the RollerCoaster Tycoon Touch Summer update for yourself? Join more than 14 million players who have been creating, customizing and sharing their own dream parks since RollerCoaster Tycoon Touch was first released in early 2017 on iOS and Android devices.